Buying a dog crate may seem like a simple decision, but there are a number of factors that should go into your decision-making process. After you decide on size, the crate material may play a role in your decision, as well as functionality and aesthetics. While not always the most attractive crates, plastic crates are ideal for dogs that prefer more privacy. If you're looking for a plastic crate for your dog, consider the Petmate Two-Door, Top-Load Kennel. Canine Journal recommends it as the top plastic dog crate on the market, primarily for its two-door construction and its combination of steel and plastic, which makes it sturdy and safe. The crate has two doors, which means you can put your pup in the crate through the top if he's hesitant to just walk in. It has a comfort carry handle and the two halves come apart, allowing you to stack it for storage. This crate has nearly 3,000 reviews on Amazon, with over three-quarters giving a 5-star rating. People love how sturdy it is, and the second top door is ideal for putting less-than-enthusiastic pets inside, right from the top. The one trade off is it's slightly heavier than other carriers, but as some reviewers note, it's worth the tiny extra weight due to durability and how long it lasts versus thinner, plastic crates. Sites like Amazon and Petco carry the Petmate crate and it comes in both a 19-inch, starting at $29.99, and a 24-inch option, starting at around $40. Choose from a few different colors (depending on the size you need), including red, white, tan, and blue, which will alter the price slightly. One of the most recommended crates, in general, comes from MidWest Homes. 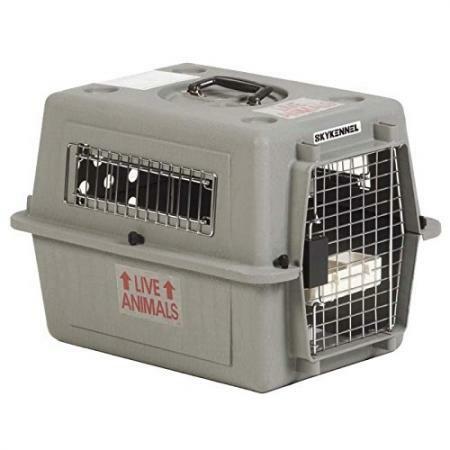 The MidWest Life Stages Folding Metal Dog Crate is recommended by numerous websites, including Best Dog Crates and Beds. They love it for its superior quality; it has a sturdy metal fame and the latches snap firmly into place. This crate comes in either a single or double door style. The double door is great if you use the provided separator to put two dogs in. You can also use the separator when your dog is a puppy, allowing him to grow into the crate over time. 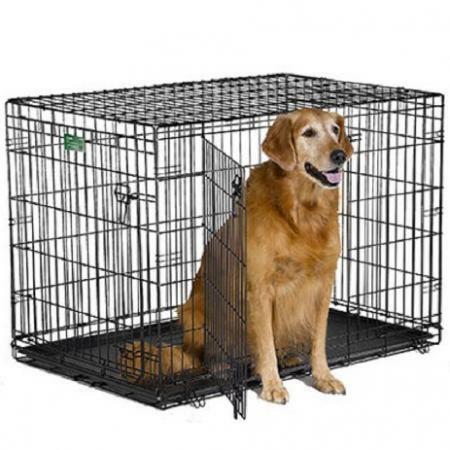 The crate comes in six different sizes, ranging from 22 inches to 48 inches, which is great for breeds over 50 lbs. You can find the MidWest Life Stages Crates on Chewy.com or the manufacturer's website. Prices vary from about $20 for a 22-inch crate to about $85 for a 48-inch crate. 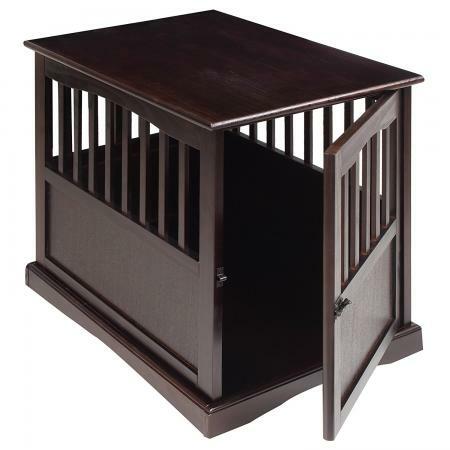 If you need your dog crate to blend in with your interior design, consider the Casual Home 600-44 Pet Crate End Table. At first glance, it looks like a regular end table, but it's actually a dog crate. It has been recommended by a number of buyers' guides in recent years, including Heavy.com's roundup of top dog crates in 2016. Although it's designed with style in mind, the Casual Home crate is still functional. It provides ample ventilation for your dog and has a secure latch closure, which is easy to open and close from the outside. The crate is made from sustainable Hevea wood and also comes in either black or white. The espresso model retails on Amazon for around $84 for the 24-inch and about $103 for the 27-inch one. Overall, reviewers who purchased the Home Crate End Table from stores like Wal-Mart love it, especially the sturdy material and ease of assembly. The one downside is it does weigh more than a standard wire mesh cage, however, it's not meant to be mobile. Another important element to note about this crate is its lack of a removable tray for accidents. Also, because it's thin, this type of crate should be for a dog that is used to being crated or doesn't go crazy when they can't see you completely. If you're looking for a crate that works both indoors and outside, consider the Firstrax Noz2Noz Sof-Krate N2 Series Indoor & Outdoor Pet Home. Top Dog Tips has a thorough first person review of the crate, and the only potential con noted may be the "new crate smell," which apparently is a bit strong. She provides tips for those who are bothered by the fabric smell, but recommends this crate, especially for dogs that aren't a fan of traditional crates. She also loves how well-ventilated it is and the easy-access three doors. It's ergonomic and easy to flatten and put back together -- taking less than a minute. The Firstrax crate is available on Chewy's website in varying sizes. The price ranges from around $75 to $110 depending on what size you get. 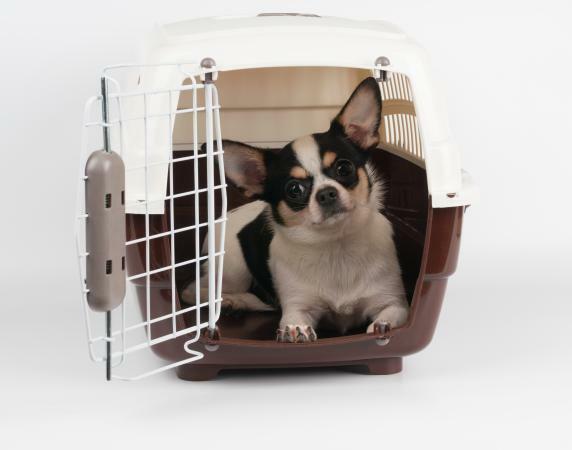 When it comes to airline travel, getting the right airline-approved dog crate can be extremely confusing and frustrating. 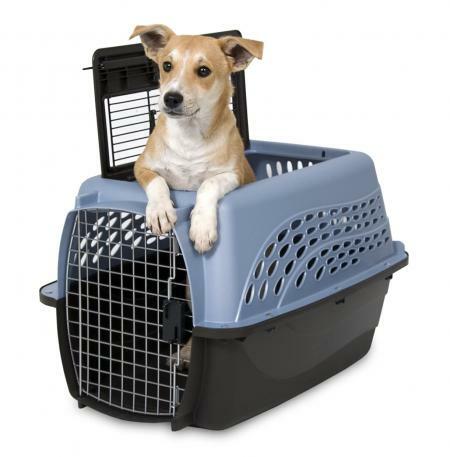 The International Air Travel Association (IATA) has strict rules on what types of dog crates are approved for air travel. K9 of Mine has a great breakdown on all the rules, and highly recommends the Petmate Sky Kennel crate. It meets all the IATA criteria except for the plastic nuts and bolts that come standard. You'll need to buy metal ones to make it fully compliant. The Petmate Sky Kennel crate comes in different sizes and can be found on a variety of sites, including 1800PetSupplies, which has the small crate for around $40, all the way up to the giant for $185. 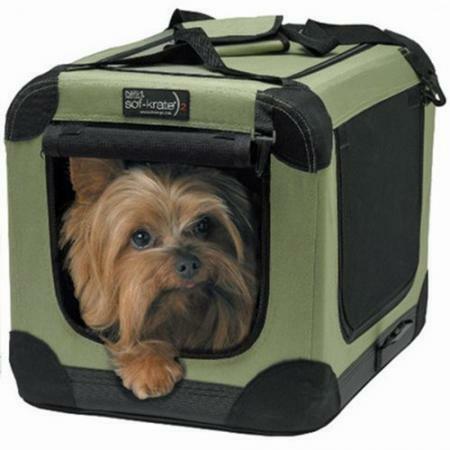 If you're traveling with a smaller dog and are looking to bring a soft-sided case on board, sites like Dogs Recommend suggests the Frontpet Expandable Carrier. Reviewers of the Frontpet Expandable Carrier love its ease of use and durability for travel. The one drawback Dogs Recommend notes is it only comes in one size, which is good for dogs around 13 pounds or less. 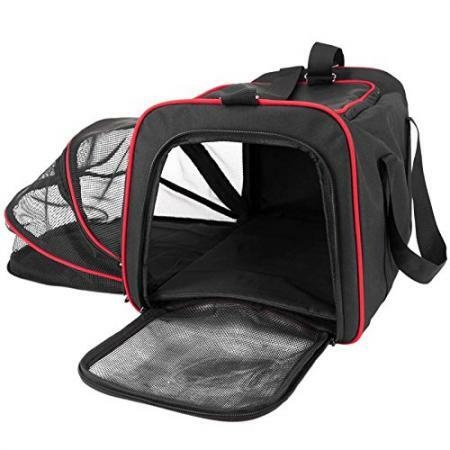 The Frontpet Expandable Carrier is available from a number of online retailers, including Sears Marketplace for under $35. Be sure to compare shipping options if you're buying a crate online as crates can be heavy. Also, look for liberal return policies if you're concerned at all about whether the crate you want is actually the best for your dog. After you've considered your needs and your dog's size, choosing the ideal crate should be easy. It's important that your dog feel secure and comfortable in his crate, but it's also important that the crate meet your needs for style and functionality. Fortunately, there are many options to choose from that will have your dog's tail wagging.